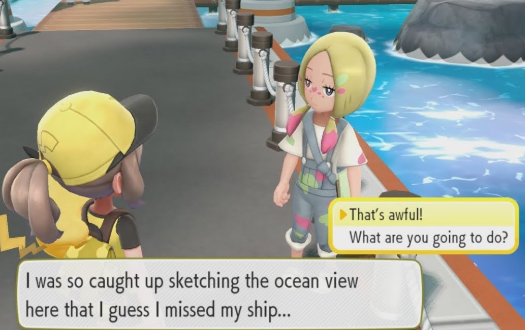 After learning the Chop Down Technique from the S.S. Anne Captain and having defeated all the trainers on board, it is now time to depart from the ship. After you do, the ship will begin to sail away. As it does, a trainer will arrive that was suppose to be on the departing ship. Her name is Mina, and she is actually a Trial Captain in the Alola Region. After missing her Ride home and having nothing better to do now that she is stuck in the Kanto Region, she will challenge you to a battle. After defeating her, you can challenge her to a battle daily.